This is a closeup view of the signature rainbow prism beam of a Spectra sundial being projected onto the end of an interior wall in this Spectra owner's home. This picture is interesting because it shows the scale of just how wide the prism beam can get as it travels through the home - the farther the rainbow color beam travels from a Spectra sundial before landing on a surface, the wider it becomes. The overall spectrum at this distance is actually several inches wider than the end of the wall is, so the deep red and deep purple edges of the total spectrum are not seen here. 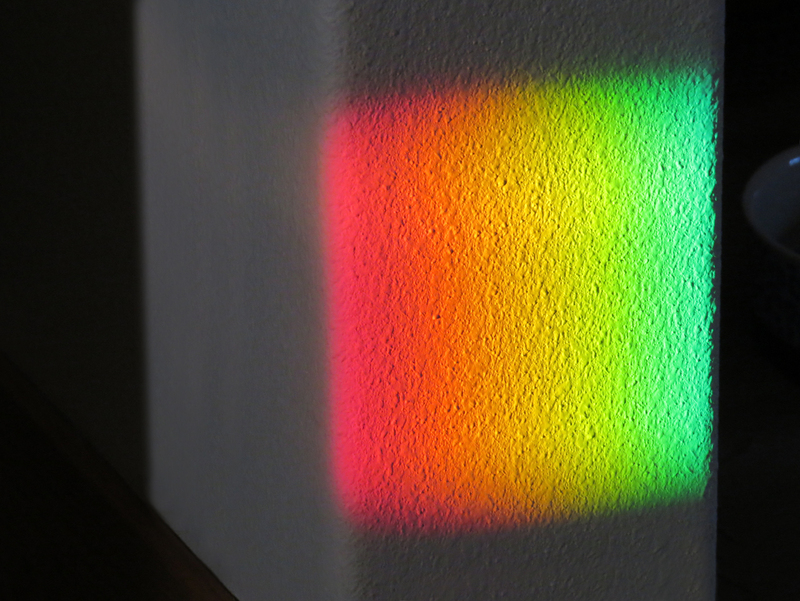 See the other photo of this spectrum in the Spectra gallery for an even closer view!